Got everything in line!? Great! Let's get started. As with any project, ensure that all requirements have been gathered well in advance to building. Correcting issues for this project won't be the end of the world but it's best to have a clear idea of which fields to include in this workflow ahead of time. What types of permissions do you want on this list? If you're working in an industry that handles lots of sensitive information, it might be best to target this only to a specific group of users by making the most of SharePoint security groups. Which columns will be created as choice columns and which will be text columns? In my example, 'Priority', 'Category', and 'Status' are choices because I leverage these columns for creating custom views (more on that later) and want standardization for reviewing and filtering. Where will this live? Since computers and software will always break and end-users will always need professional assistance, a ticketing system should always be present. Therefore, find a place in your Intranet that is expected to have a happy, long life and place it in an area that is intuitive for both end-users and administrative IT staff. Imagine that Rhafiq's computer starts on fire and he has a presentation to arrange with a deadline of two hours from now. You'd want him to know exactly where to go to submit his claim to the people equipped to fix it. While many of these customizations exist to draw the Help Desk Admin's attention to certain tickets over others (such as past-due follow-up dates showing as bold and red and high-priority tickets displaying a red ! icon), some provide some actual utility. For example, the mailbox icon next to the submitter's name is a mailto link that automatically addresses the submitter. This is helpful for if the Help Desk Admin has follow-up questions or needs additional details. Next, we will create the form for user entry. PowerApps could be an approach for this, but for the purposes of this specific task, I resorted to Microsoft Forms to increase maintainability once we hand this solution off to the client since Forms is much easier to manage as an end-user than PowerApps. 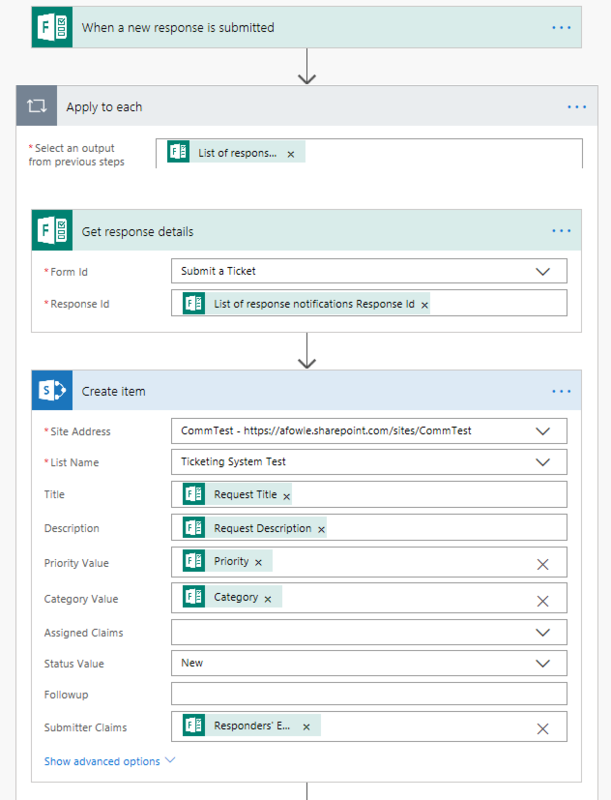 Include only the fields that the user is expected to fill out and leave out the rest; soon, we will look at how to pull the user input of this form into SharePoint. As you can see, when a new request is submitted through Forms, the inputted information is parsed to the relevant fields in the SharePoint list. The Form is used to prevent the user from manipulating the back-end fields, such as Assigned and Followup. 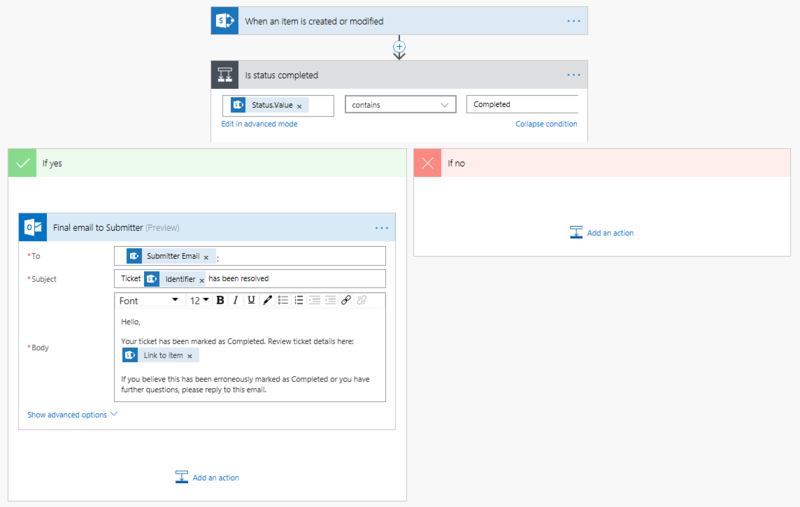 The workflow creates the item in SharePoint, sends an email to the IT Help Desk (I recommend using an O365 Group email for this to ensure that all members of the team receive the request), and sends a confirmation email to the submitter that their ticket was received. 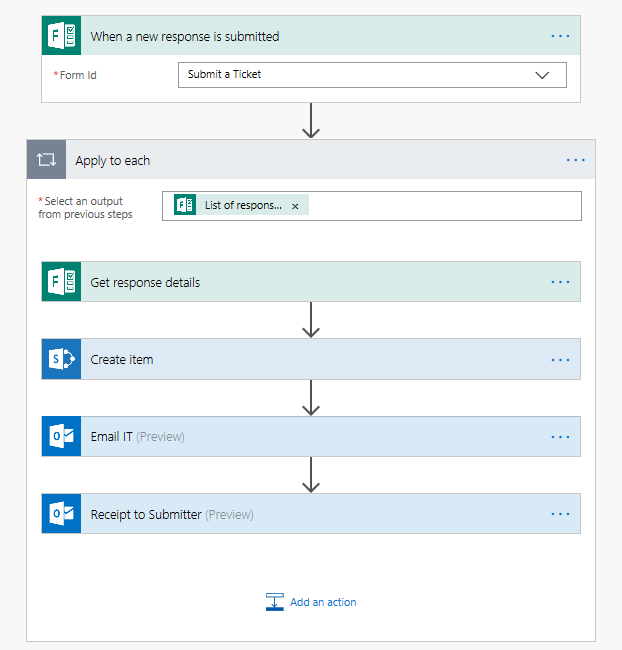 NOTE: The account you use to design this Flow should have "send as" access to a mailbox that is regularly monitored and the "send as" field in the Outlook connectors should list the appropriate mailbox. If someone responds to the receipt email, you'll want to know that it will be reviewed by the appropriate channels. From this point, the Help Desk will be notified of the new request and respond accordingly. This part takes a bit of user training; the Help Desk representative will need to edit the list item, assign it to a member on their team, and set a follow-up date (if necessary). Finally--and this point is important--we need to share our creations with others. Share your Flow with someone else or another trusted group in your tenant to ensure the highest availability and do the same for your Form (although you can't fully transfer ownership; this is why using a permanent service account is important). Lastly, you want to make sure that permissions on the SharePoint list behind the ticketing system has more than one trusted owner. 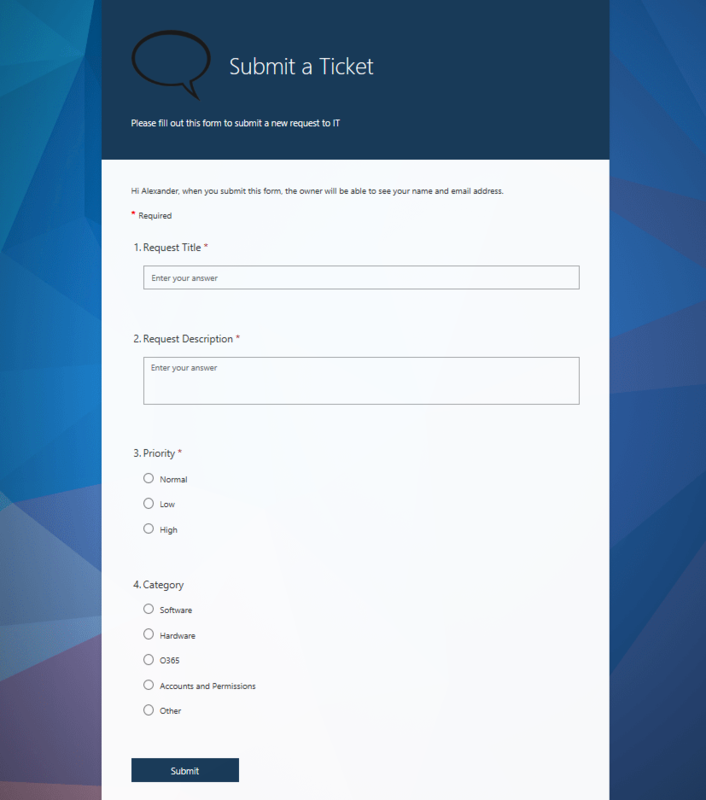 The last thing you'll want to accomplish to stand up this basic ticketing system in SharePoint Online is surfacing the Form using the Forms web part on an accessible and intuitive SharePoint site. Again, if Rhafiq's computer is on fire, you want him to be able to get ahold of IT well before the entire building catches on. And there you have it! In 20 minutes, you can have a ticketing system for your organization's help desk without having to spend any more than you already spend on your Office 365 subscription. This example is simple and could grow with greater requirements; for example, you could create a workflow to enable users to easily re-open tickets or use an Azure SQL database to track ticket updates and metrics. However, this strategy worked for my client and I hope it helps you at least get a start on your solution, too.